He has just turned 17! But his works and accolades are that of a middle-aged!! He received recognition from the United Nations Environment Program when he was 15. He was honored with India Award 2015 by the United States Green Building Council. He started a YouTube channel called ‘My Organic Farm’, which has over 2000 subscribers, 100,000 views. This channel, where he has posted step-by-step videos on organic farming and waste management for beginners, has been viewed in more than 170 countries. He responds to viewers’ questions through more practical videos. He has worked with schools in the installation of vermi-composting set-ups for wet waste management in their campuses. He has also conducted talks and drives at corporate houses to spread awareness on organic farming and waste management. He is Arya Pudota. Arya Pudota practices organic farming and spreads awareness among people about sustainable living and waste management. 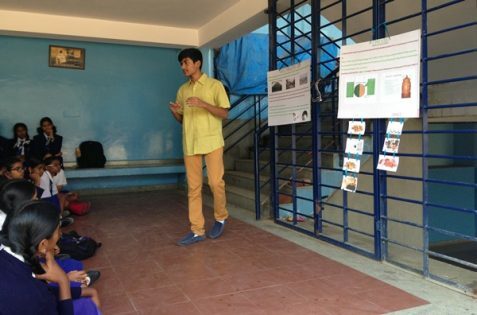 A Class XII Science student of National Public School, Indiranagar, Bangalore, he wishes to pursue his graduation in computational sustainability. He is also an Ashoka youth venturer. Here is an excerpt of an interview with Arya Pudota on his organic farming journey, taken by Manoshi Sinha, Editor of My India My Glory online magazine. When did you start practicing organic farming? Who is your inspiration? Arya Pudota: I belong to the farming community, my grandparents being farmers. My inspiration is my mother. When I was 10, I used to watch my mother practice organic farming on a plot of land next to our house in Bangalore. I started with little things like helping my mother water the plants or clean the weeds including harvesting. My interest grew slowly as time went by and I began to take more interest in the garden. As I gained more knowledge about the practice of organic farming, I realized how important it was for more people to gain knowledge about the importance of organic farming and its key role in sustainable agriculture. Hence, I decided to take this initiative forward. Any event that you have organized to spread awareness about organic farming? 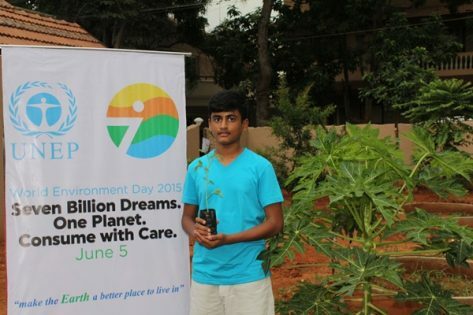 Arya Pudota: I organized an event on the occasion of World Environment Day, 2015, where I distributed 1,000 tomato saplings to walkers at Cubbon Park in Bangalore. 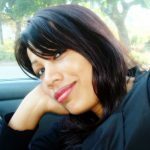 My objective was to spread the message of sustainable living and organic farming and to provide an experience to people about how it was to grow their own food. In 2016, I organized three events. The first was in KBR Park in Hyderabad, where I gave away close to 700 tree saplings of different varieties to the visitors at the park to increase the green cover in Hyderabad and raise awareness about the ill effects of global warming. The event was sponsored by the Telangana Forest Department. The second drive was in my locality and the mission was to increase the number of trees in the community. 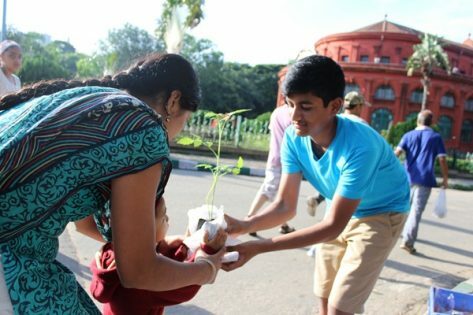 We gave away around 400 trees to the residents of Banaswadi in Bangalore. These trees were subsidized by the Karnataka Forest Department. I have also created the first recreational garden and given away saplings to teachers as drives at my school in National Public School Indiranagar, Bangalore. The final drive was conducted in association with Prafull Oorja at ED Venture Academy and other special needs schools where we worked with special needs children and taught them a bit about farming practices. Any other initiatives that you have started in addition to organic farming? Arya Pudota: I also do work on management of solid waste. I give talks in schools on this as well as organic farming. I’ve worked with schools in the installation of vermi-composting set-ups for wet waste management in their campuses. I’ve also conducted talks and drives at corporate houses to spread awareness. How do you reach a wider audience to spread awareness about your initiatives? Arya Pudota: The other outreach methods that I use are through my YouTube channel, My Organic Farm, where I upload videos demonstrating organic farming and waste management. The channel has been very successful in its outreach, having more than 2000 subscribers, 100,000 views and has been viewed in more than 170 countries. Along with the YouTube channel I also have a website, which contains more information about the activities I do and a blog. 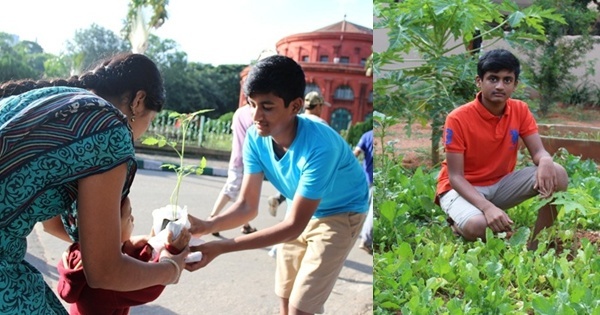 Arya Pudota: I received recognition from the United Nations Environment Program for the activity that I conducted in Cubbon Park. My activity has also been featured on their website. I have been recognized by my community welfare association, the Bhuvanagiri Welfare Association for my initiatives in association with them. 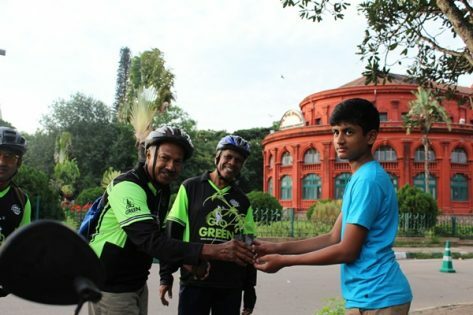 I have also been awarded the 1st place in Bangalore for Green Apple Day of Service – India Award 2015 by the United States Green Building Council for the contributions I have made towards the environment. I am the Senior Secretary of the Environment/Social Service Club in my school (SEWA). The school has greatly helped me carry out my initiatives, as they encourage the all round development of children. I have also been recognized by my school for my achievements in organic farming and featured on the school website. Can you please tell us about GrowBaSiC kit and how the idea about it cropped up? Arya Pudota: I’ve been posting videos on my YouTube channel for the past 2 and a half years, and have posted a lot of videos to educate people on growing different types of fruits and vegetables. However, I have received many e-mails and read many comments from people who have said that it has been very difficult for them to source the materials necessary to start their organic farming practice. Other problems included lack of nearby gardening stores and nurseries which could offer manageable quantities of the necessary items at a competitive price-point, and of course, a busy time schedule that prevented many from going out to get the necessary items. Keeping all these factors in mind, I decided to create an organic farming kit, the GrowBaSiC. I launched it on the occasion of World Environment Day 2017. It is a one-stop solution that contains all the necessary raw materials required to start a basic organic farm at home. It is very easy to use, and can be used by children as young as 4 years of age. The kit consists of a grow bag, a coco peat block, neem fertilizer and some vegetable seeds. The procedure to be followed for using the product has been detailed on a YouTube video uploaded in my channel. The kit is also competitively priced. 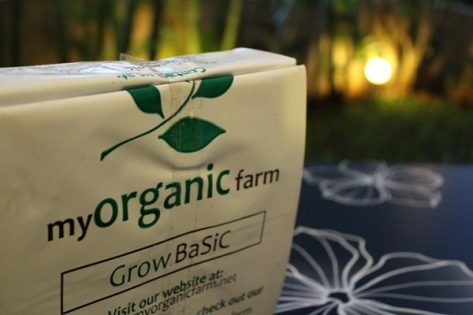 We expect one of the major customers for these grow kits to be educational institutes and corporates, who may want to use these kits as method of educating their students/employees about organic farming and agriculture. We plan to offer these kits to these organizations at a subsidized rate. It’s also a really great return gift to give out for celebratory functions and events. It is also a good way to keep kids away from their mobile phones, iPads and other electronic devices by offering them a fun outdoor activity, besides being a great educational tool. Another plus point is that kids would have a sense of accomplishment because of growing their own produce. I also want to remind customers of this product that it aims to provide a basic introduction to the world of organic farming. I urge people to graduate to larger patches for their organic farming after some practice with this kit. Any future initiatives that you have planned? 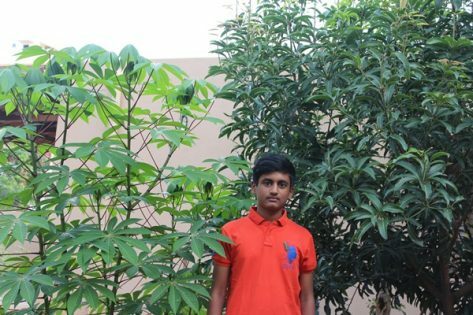 Arya Pudota: I am focusing on the promotion of GrowBaSiC kits and plan to have sapling donation drives in metropolitan cities all over India. Arya Pudota: Grow and eat organic, not just for your benefit, but for the future generations. Readers interested in organic farming, irrespective of whether in the city or village may contact Arya Pudota at aryapudota@gmail.com.